Wadi Bashing is a unique adventure sports in Abu Dhabi. A wadi is a dry and rocky riverbed, which follows the course of seasonal streams and rivers through rocky valleys naturally carved out by floodwaters. Wadi is found in plenty in the deserts around Abu Dhabi. The twisted routes are perfect for four wheel driving. The best season for Wadi Bashing in Abu Dhabi is from October to April. Wadi Bashing in Abu Dhabi requires lot of courage and expertise in driving. 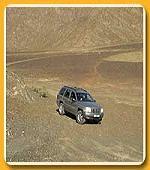 It is not easy to drive on sand; therefore the instructions of an experienced driver are necessary. The going can be tough in this bone-shaking journey but the experience of Wadi Bashing in Abu Dhabi will linger on for the lifetime. You may catch the sight of a mountain pool, waterfall, local tribes or animals like gazelle on Wadi Bashing in Abu Dhabi. Carry your camping gears if you are interested in the night stay to appreciate the desert beauty. Every tourist must add Wadi Bashing in their list of sports activities. You can go for wadi bashing when you are on a desert safari in Dubai or Abu Dhabi. Wadi Bashing is a tough adventure sport and one must consult a wadi-bashing expert before taking the plunge. Instructions are mandatory to avoid any unpleasant accident. Also, there is a possibility of being marooned on an island if one's not good at the sport. Avoid the summer months, when the temperatures soar and Wadi Bashing is difficult to do and enjoy. The essentials that one must have are sunglasses and a cap, which protect them from direct sunlight. In winters, one must carry sweaters. Camping gears, too are a good idea if one is looking forward to a night stay. Wadi bashing is an interesting and unique experience that one will cherish for the rest of their lives. Dubai and Abu Dhabi are the best places where one can indulge in wadi bashing.